Across the Pacific in Seattle collectors Bob Kaplan and Margaret Levi have developed a relationship with their local Seattle Art Museum (SAM) so that a 100+ artwork show opens today and runs into September. And even though there's only optimism at this stage that this generous show plus catalogue will tour on beyond Seattle to other American institutions, the efforts being made to introduce our Indigenous art yet again to America are pretty smart. Co-curator Pamela McClusky, for instance – the long-serving specialist at SAM in African & Oceanic art who first bought into the Kaplan/Levi's enthusiasm for this art – provides a perfect outsider's approach with accolades like the title above and clear insistence that what her readers are looking at is “how deceptively simple means yield richly multi-layered meanings” as “artists show the world another way to experience not only their own country but nature itself, wherever it is encountered”. So how did it become an integral part of the Kaplan/Levi's lives? Levi was the instigator and Australia Post the catalyst! For this academic who manages to hold professorships in both the Department of Political Science, University of Washington and the United States Studies Centre at the University of Sydney, was injured by a post van in 1985 and received a payout in 1991. She and her husband, lawyer Bob Kaplan, decided to dedicate that to buying 'museum quality' Aboriginal artworks. Kaplan “had to see the art in Australia and meet the artists on their home ground to attune his eye”. But when that was in, he and Levi could walk into a gallery passing an unmissable artwork in the window and announce, “We'll take that” to the staff , “without even looking at each other”! In 20 years they've accumulated 600 works in all – just over 100 of which will be seen at SAM. They have high ethical standards for their purchases but Levi admits that they became “committed” to a handful of their artists – Dorothy Napangardi was the first name to spring to her mind, Kathleen Petyarre and Abie Loy followed (for Levi has an acrylic bias, while Kaplan is a bark man first and foremost); Gunybi Ganambarr and Djambawa Marwili are two more of their favourites – and the latter is there in person for tonight's opening, also taking part in a university forum with local Native Americans on the matter of Indigenous Marine Rights in which the Yolngu leader is an expert following the successful Blue Mud Bay case in Arnhemland. Also at the opening will be Michael Brand, Director-in-waiting at the Art Gallery of NSW – suggesting a greater enthusiasm for Aboriginal art than his predecessor! 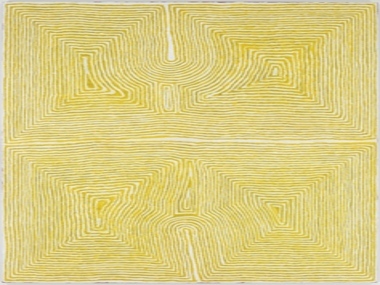 Despite the Kaplan/Levi preferences, the curatorial team has opted to offer audiences an in depth look at three, more predictable leading artists – Emily Kngwarreye, Rover Thomas and Johnny Mawurndjul. 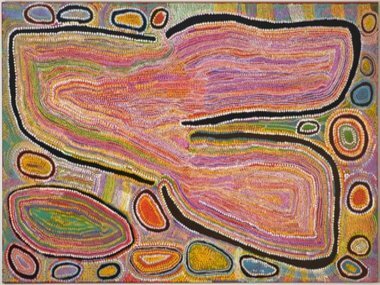 But it was to Kathleeen Petyarre that Pamela McClusky turned in her catalogue essay to make some important points about Aboriginal art for beginners. She posits the artist's Mountain Devil Dreaming works with their myriad of sand-like dots that look nothinglike the thorny little lizard in question – dots that simultaneously evoke the patterns on the Devil's back, the sandstorms that inhibit her actual and Dreaming progress, the tracks of her passage across Petyarre country, and the seeds that must sustain her and those that Dream her. Added all together, we have a metaphor of the absolute need for collaboration to survive in harsh climes and the mnemonics for the women's ceremonies that permit those survival forces to align. Not that the complexity of this story would have caused the Kaplan/Levi purchase. “Our major reasons for buying are always aesthetic”, insists Margaret Levi. “We love learning the stories, the rituals associated and the wider cultural picture. But the look matters first”. And it helps that the couple have committed their collection to an institution like SAM, as this pushes them up the queue when art centres and galleries are thinking about who they might offer their finest product to. In the meantime, they live with their art in a loft that's in a Seattle building especially built for art collectors. Fifty or so works will be on the walls in an ever-changing hang, the rest in a racked storage space that's in the same building. And as the Kaplan/Levi show closes in September, another big American collection takes its place on the other side of the country. 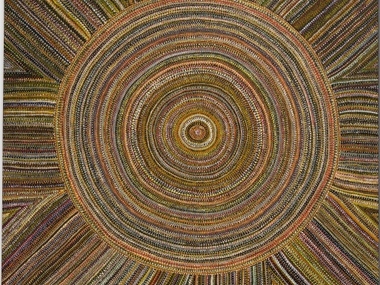 The (Will) Owen and (Harvey) Wagner Collection of Aboriginal Australian Art opens at the Hood Museum of Art in New Hampshire on September 15, showing until March 10, 2013. Then it moves to Ohio – the Toledo Art Museum - not uncoincidentally presided over the Brian Kennedy, ex-NGA Director and ex-Hood Museum, where he negotiated the gift of the Owen and Wagner Collection. Addendum: Gee they take things seriously in Seattle. Couldn't resist adding this link to a local children's publication tackling Aboriginal art as well as any adult organ in Oz!